Rogue wave photo taken from the deck of the RV Cape Henlopen in the western North Atlantic during the Atlantic Remote Sensing Land/Ocean Experiment (ARSLOE) The crest of the rogue propogates from the right to left. Credit: H. MitsuyasuInset figure: Surface elevation of groups in each period band displayed on axes of time and logarithm of period in seconds. All 32 periods are displayed and their sum (divided by 20) is graphed along the time axis. The Andrea crest is at 862 s. Credit: Donelan, et.al. The data from the 100-meter wide "wall of water" moving at 40 miles per hour showed that Andrea may have reached heights greater than the recorded height of 49 feet above mean sea level. They also found that rogue waves are not rare as previously thought and occur roughly twice daily at any given location in a storm. The findings showed that the steeper the waves are, the less frequent their occurrence, which is about every three weeks at any location for the steepest rogues. The Andrea crest height was 1.63 times the significant height (average height of the one third highest waves). Optimal focusing of the Andrea wave showed that the crest could have been even higher and limited by breaking at 1.7 times the significant height. This establishes the greatest height rogues can reach for any given (or forecasted) significant height. 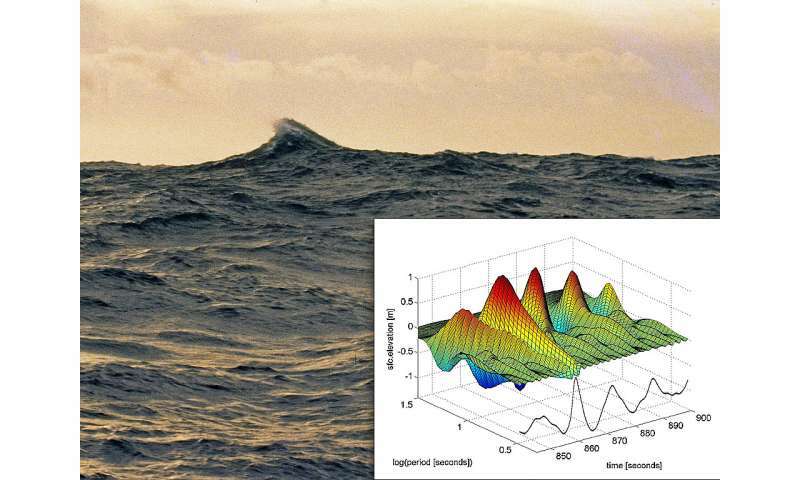 "Rogue waves are known to have caused loss of life as well as damage to ships and offshore structures," said Mark Donelan, professor emeritus of ocean sciences at the UM Rosenstiel School. "Our results, while representing the worst-case rogue wave forecast, are new knowledge important for the design and safe operations for ships and platforms at sea."